← Happy 2nd Anniversary, Andy! Four weeks of Best Body Bootcamp complete! Week 1 and 2 were great. Week 3 stunk. Week 4 was mostly good. The best part of it all is I’ve actually been sore. Ya know, the good sore. Besides the workouts, we set two goals each week. My goals this week were more water and only one dessert after each meal. Water intake was great and I’m quite embarrassed to admit that one dessert after each meal was VERY difficult. I only accomplished that 5 out of 7 days. Week 5 kicked off today. Guess what. I worked out AND enjoyed it. I could only get the first two sets in before going to work but I finished up this evening. Not my favorite way to do it but the most important thing is, I did it! Woohoo! To help my motivation, I’ve joined another group to help me through the holidays. I feel like I’m in AA or something with all these support groups! 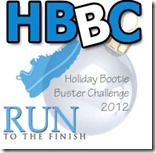 Welcome Holiday Bootie Buster Challenge! Honestly, a holiday challenge scares the crap out of me. The PRESSURE!! But, really, this is also why I’m signing up. Keeps me motivated. And who doesn’t need extra motivation to stay in shape and eat well during the holidays? 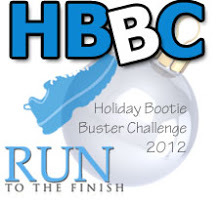 The HBBC is a competition with all the points publicly posted (yikes!) so that will help keep me motivated too. You earn points based on your activity, fruit and veggie consumption, and a host of other things. It’s not too late to join if you want to join me. I think it’s time for a Callan update too. This little guy is 4 months old. Love this kid! He’s so going to kill me one day for posting this ridiculous picture. He was posing for his 4 month pictures. One more thing for ya. I’m back to posting recipes. I’ve been cooking up a dairy-free storm and have a ton of new recipes I’m excited to share. Good job Em! Keep up the good work! And what a stinkin’ cutie! !